CASTLETON—Nineteen Castleton students traded in their final break of the academic year for some hard hats, hammers, and building supplies, as members of the Habitat for Humanity Club made the journey to Dekalb County, Ga., as part of an alternative spring break trip. The volunteer group spent their time working with the local community on various service projects in the area. Before arriving at their destination, the group made a special stop in Winston-Salem, N. C., the location of their 2016 alternative spring break. Club members both past and present had the opportunity to revel in their prior work, spending the night at the Forsyth County Habitat’s Volunteer Lodge they had helped build nearly 12 months ago. “I had seen pictures and it looked amazing, but actually being able to walk in and know that we did this was incredible to see,” said Johnson. Upon arrival in Georgia the group got right to work, helping to build interior walls and supports for a local community homeowner. 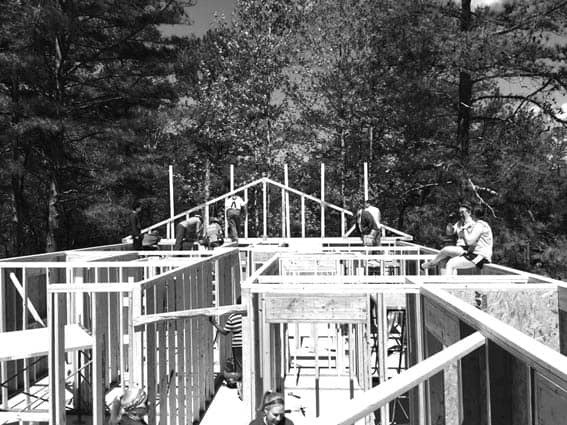 By the end of their stay students were adding trusses for the roof of the house, nearing its completion. Although the group battled Mother Nature throughout their travels, experiencing the aftermath of a nearby tornado and putting them several days behind schedule, they were able to complete the project on time before returning to Vermont. Utilizing their work and volunteer hours a little closer to home the Castleton Habitat Club plans to break ground again in April as part of Project Vision in Rutland City. The group will complete the upcoming project working alongside local affiliates such as the Rutland and Bennington County Habitat for Humanity members. Castleton students rolled up their sleeves on a recent service trip to Dekalb, Ga.